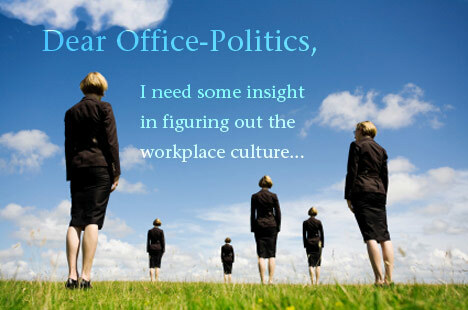 Office-Politics » Part One: Office Picnic is no picnic! Part One: Office Picnic is no picnic! I need some insight in figuring out what type of workplace culture I’ve joined. I joined a new company in April. At first it seemed friendly enough. I wasn’t looking for perfection nor to assume that my co-workers would become my “friends.” Though I’m at a loss to define it. It’s a very quiet, busy, cubicle environment (only mgrs have offices) and most everyone (including my team) keeps to themselves, except for the occasional happy hour. I’ve been at my new job since April — I have observed that even the managers do not associate or collaborate with each other — their doors stay closed a lot. Functionally, we’re all in the same group. So… a week ago we had our annual group picnic – it was about fifty of us. The picnic was slated from 12-3. Most of the women were dressed business casual, a few were casually dressed, and a couple of business suits – with flip flops or tennis shoes. Mind you, the picnic notice had pictures of volleyball, softball, etc. No — we didn’t play . It was very awkward and strange to me — we all sat down to eat — conversation was minimal — and I noticed that even the other departments did not really talk to each other — it was like sitting in the company cafeteria. There was no music as well. What am I missing? There’s definitely an undercurrent — not totally unpleasant — but I can’t put my finger on it. No one seemed hostile towards the other, but the picnic seemed like a company of strangers… or do I just feel like I’m on the outside? Play this game with me…. See yourself as an anthropologist exploring a different culture. What are its tribal customs? Costumes? Rituals? Seems like the culture at your new job is unlike any other you’ve experienced before. Do you want to join this culture? Can you be comfortable in it? It appears that your colleagues are fine with the culture. It appears that everyone treats their job as such — a job — not a place to build relationships and connection. That’s ok.
My main question is can that be ok for you? I’d give your job a good solid 90 days simply so you can explore this new culture and find colleagues you resonate with. Out of fifty people I’m confident you’ll find some. If not, you may want to do some soul-searching to determine if there were signs in the interviewing process that you may have missed. If so, resolve to look more closely into the culture and human dynamics during future job interviews. And if the culture genuinely is affecting your work performance and overall happiness, start your quest for a new job. Thank you so much for the advice from both authors (Jennifer and Christine). It gives me some things to think about, particuarly within myself – about my expectations and perspective. To answer the performance questions, I’m still learning the policies and expectations, etc but whether performance or objectives suffer—I can’t tell yet. It’s a contract environment – so focus and quiet are part of the package. I can say that so far, the other functional groups and technical people work differently together (separation + more top to bottom dissemination) than I’ve experienced (more collaboration between depts). I’ve had some frustrating moments—but now have to re-think why. I’m willing to give it a try – and willing to try the ideas too, as well as adjusting my expectations/perspective and see where it leads. I have alot to think about.